The only differences between the Nov. 2 gun attack on buses carrying Coptic Christians on their way back from a visit to St. Samuel’s Monastery in Upper Egypt and a similar attack that happened in May 2017 are the names of the martyrs and the numbers killed. In the recent attack, seven people were killed and 21 were injured, while in the one that took place last year 28 were killed and more than 50 injured. The two attacks were carried out in the same location (separated only by three kilometers) and in the same manner; and the ideology that led those terrorists to kill the Copts is also the same. The Egyptian security forces did not learn from the first incident and were slow to respond to the demands of those who run the monastery, including paving the 30-kilometer road leading to the monastery, providing a telecommunications network in the area, installing security cameras, and dispatching a security force to protect the monastery. After the May 2017 incident, the security forces blocked the road for a while but, amid increasing complaints, it was reopened as there was no other route. Nevertheless, appeals continued for speeding up the process for paving and preparing the road, but this never happened. There were many rumors about a renewed religious discourse following a demand by President Abdel Fattah El-Sisi, the response of Al-Azhar, and the attempts of a few religious bodies and institutions to work accordingly. But some mosques continue to openly incite hatred against the Copts, urging people to kill them. Silence in the face of these fatwas is intolerable. The rhetoric of hatred and extremism is not ending. In fact, it is expanding day after day. The deceleration of the process to secure and protect the road was accompanied by the deceleration of facing up to these fatwas. A lot of effort is still required to combat them, including methods that rely, first and foremost, on enlightened thinking. The danger lies in the fact that Daesh and other extremist religious and armed groups are using their crimes to desensitize society to terrorism; turn their crimes into an authentic part of popular culture; and try to establish their acts as daily and public habits that create the chaos they need to prove themselves and strengthen their standing. They want to turn the death of Copts or any Egyptian into trivial news that passes unnoticed — and this is the problem that requires radical solutions. The rhetoric of hatred and extremism is not ending. In fact, it is expanding day after day. In the funeral tent of the monastery’s victims, everyone noticed a look of reproach to Egypt: A look that bore all the suffering they have experienced throughout their history and continue to experience today. The Copts have been loyal to their Egyptian and Arab identity and have always lived in harmony with the Muslim majority. I do not claim that relations between them and others have always been prosperous or safe, but I am saying that they experienced periods of adversity, such as “the era of martyrs,” when the Romans persecuted them. But are the Copts of Egypt suffering in the present age? This is an important question that we must ask ourselves. 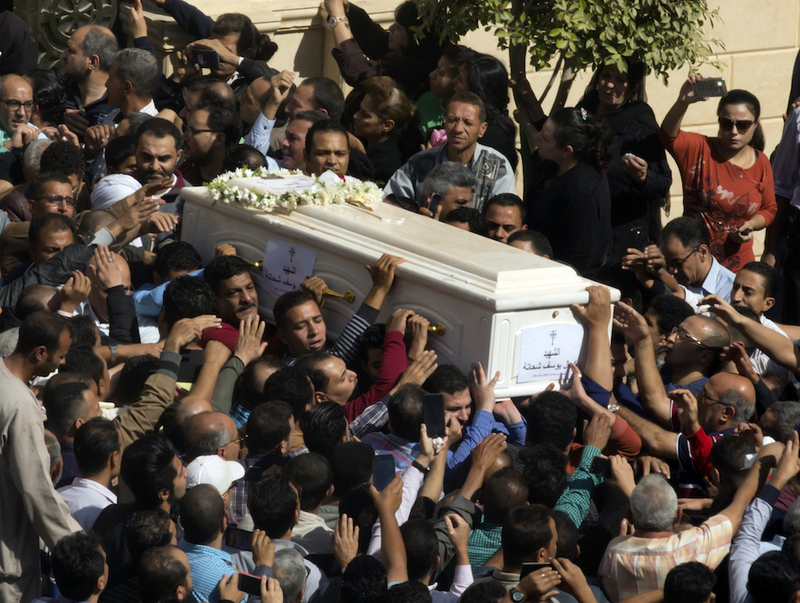 The Copts are today the target of terrorist attacks — this is an indisputable matter. However, the topic worth discussing is the suffering of the state’s institutions: Society is growing more intolerant of them, especially in villages and the poorer and more ignorant areas, as a result of the absence of the rule of law and the state’s failure to fulfill its cultural and educational obligations. The killing of all perpetrators of the crime against the Copts of Minya, according to the story told by the Egyptian security forces, has heartened people a little, but I imagine that the survival of only one of them and subsequent interrogation would have reopened so many wounds. It is necessary to open all wounds because renewing religious discourse and disseminating the true teachings of Islam will not have much effect when the vast majority of fanatics interpret religious texts in a literal manner, without taking into account their historical and cultural context, promote outdated and obsolete ideas, and destroy all progress made by humanity. There is no doubt that terrorists seek to establish control and influence the minds of the public and the youth, whether by force and oppression or through promoting false fatwas and misconceptions on social media and other types of media. This has played a major role in promoting violence and chaos, threatening peace and security in many countries around the world. Facing up to extremists requires a critical mind that rejects them and deals with them based on their historical and cultural context. Combating terrorism requires both an armed confrontation and an intellectual one. The importance of the institutions of civil society lies in the fact that they are a bridge between individuals, society, citizens and the state. Civil society institutions strengthen and consolidate the values and rights of citizenship, democracy and coexistence, which is why they have many roles in the face of all forms of terrorism. The crime against the Copts of Minya is one of the many terrorist crimes that have hit the heart of Egypt, and it is very likely that this will not be the last to do so, as long as confrontation is limited to words, not actions. Action must be taken by all state institutions so that such crimes are never repeated.